Dropbox is a popular online backup and file synchronization service. When Dropbox synchronizes files between your computers and the online storage, it encrypts the files while transferring them over the Internet, preventing other people from eavesdropping on your data. However, the Dropbox folder on your computer remains unprotected: Dropbox does not do anything special to restrict access to it. What if you lose your laptop or someone steals your computer? Wouldn’t it be nice to protect your local Dropbox folder with strong encryption, too? You can protect your Dropbox folder using our strong encryption software USBCrypt. Yes, USBCrypt is not just for protecting the external drives, you can use it as a general-purpose encryption tool, as well. You can create a Virtual Encrypted Disk on your main C: drive, or on another drive that your computer has, and move your Dropbox folder onto the encrypted drive. This will make the files you store in the Dropbox folder safe. Let’s begin by starting the Virtual Encrypted Disk which you want to use to keep your Dropbox files in. (If you have not created it yet, now is the time to do that.) Remember that when you start the encrypted drive, it will have a different drive letter than the host disk. In this example, the host drive is G: and the Virtual Encrypted Disk is K:, on your computer the drive letters could be different. When starting the Virtual Encrypted Disk, select the option to start is as the fixed rather than removable disk. To do that, click on the More options button (located on the same page where you enter your encryption password) and select the option “Start as a fixed (rather than removable) disk”. The reason why this is necessary is that DropBox software may refuse to setup its folder on a drive that is marked as removable by Windows. Dropbox will move the folder to the encrypted drive for you. If you get an error that the folder cannot be moved to the removable drive, restart the Virtual Encrypted Disk as a removable disk (see above) and try again. After that, the files you put in the Dropbox folder will be protected with strong encryption and no one would be able to get them without the correct password. The problem that remains to be solved is that if you leave Dropbox settings as they are now, then next time you start your computer Dropbox will complain that it cannot find its folder. 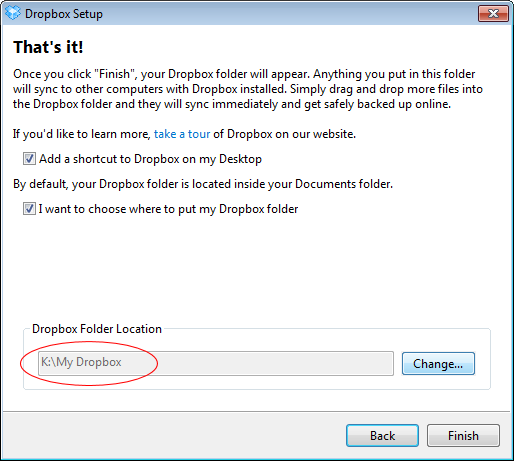 This is expected, because by default Dropbox is configured to start automatically when you log in to Windows, and when it starts, it tries to locate its folder right away, before you have a chance to enter the password to start the Virtual Encrypted Disk. 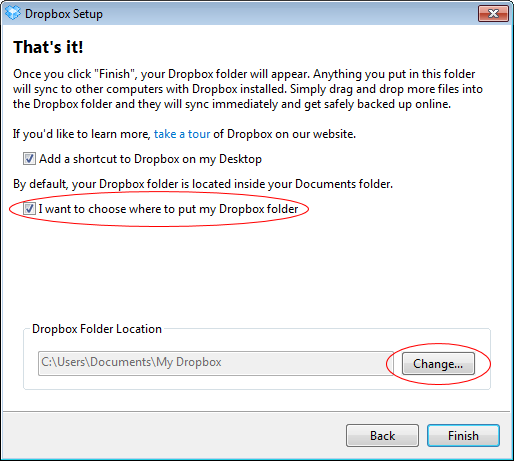 To solve this problem, change the Dropbox autostart option: right-click on the Dropbox taskbar icon, choose Preferences from the menu, and clear the Start Dropbox on system startup option (see the image above). 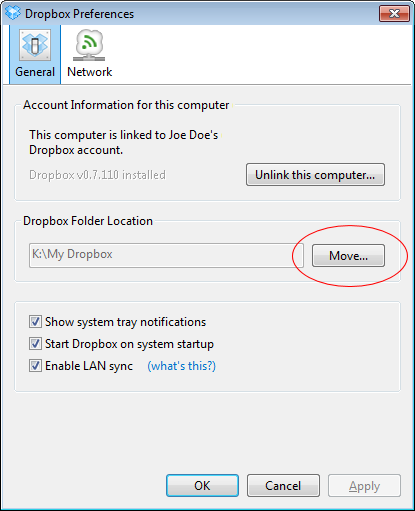 Instead of starting it automatically, you would start Dropbox manually, by double-clicking on its desktop icon, after you’ve started the Virtual Encrypted Disk. 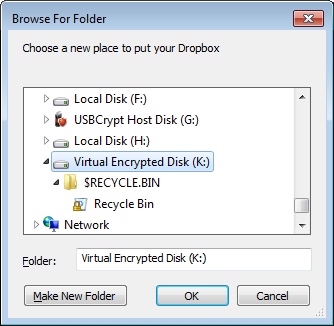 From now on, whenever you start the Virtual Encrypted Disk, the Dropbox software should start automatically, too. The last thing to discuss is stopping the Virtual Encrypted Disk that has the Dropbox folder. Before stopping the disk, you need to exit Dropbox software (by right-clicking on its taskbar icon and choosing Exit from the menu). Otherwise, if you attempt to stop the Virtual Encrypted Disk while Dropbox software is running, USBCrypt will report that the Virtual Encrypted Disk is in use and cannot be stopped. Exiting Dropbox software before stopping the drive solves this problem, unless you have some other software running that uses the files on the encrypted drive. If this is the case, you need to exit such programs, as well. I have already got a dropbox folder can it be dragged into the virtual encrypted disk? If not how can it be put into the virtual encrypted disk? What is eight minus 2 ?